THE MONASTIR SYNAGOGUE IN THESSALONIKI!! Children held the flag of Israel. Odes and hymns for David flooded throughout the synagogue. Hands held the Mezuzah parchments of prayer inscribed with religious texts, including those of Rabbi Aaron Israel, Chief Turkish Rabbi Hakham Bashi Ishak Haleva and Israeli Ambassador to Greece, Irit Ben-Abba. The Jewish heikal (sanctuary) opened again. Hymns accompanied the procession of the Hachnasat Sefer Torah in the welcoming of the new religious handwritten Torah scrolls to their new home. The members of the congregation touched the edge of their tallit to the Sefer Torah, and then kissed it as a sign of respect. Prayers, Sephardic songs (by Marty Eisenstein), the Hatikva national anthem, and official welcomes with messages of peace filled the room. 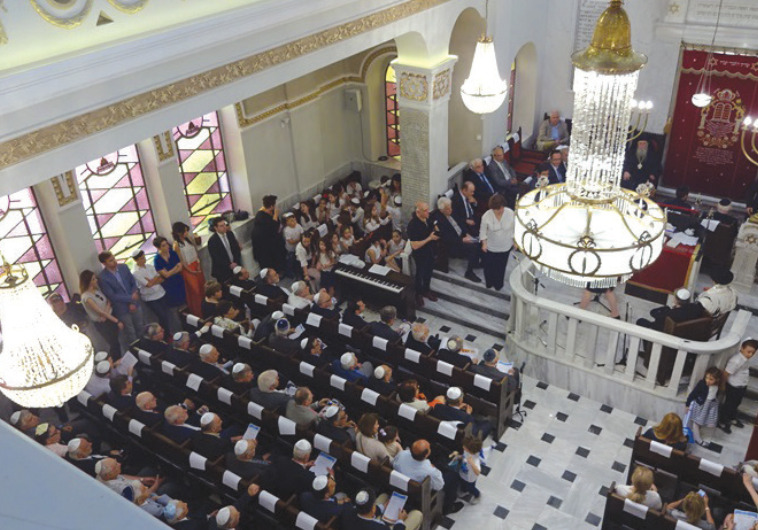 Rich and powerful rituals accompanied the inauguration of the renovated Monastir Synagogue that stands as a symbol of Thessaloniki’s strong former Jewish presence. Eighty-nine years after it was first built, the synagogue on Syngrou Street opened its doors again on May 14, to coincide with the anniversary of Israel’s Declaration of Independence in 1948. 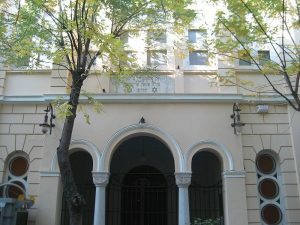 The synagogue is the only thing that remains of Thessaloniki’s rich Jewish past following the Nazi destruction during World War II, and has become a post-war symbol of the decimated community. At this second opening, it sparkled with radiance, outside and within. New colors and finishes were added to accentuate the initial design and its symbolic characteristics (the star of David, the seven-branched menorah candlestick), and work was also done on its façade, marked with Byzantine and more eastern influences. Renovation, thanks to the support of Germany and US-based realtor Herb Simon via the Herbert Simon Family Foundation, was undertaken by the architects Ilias Messinas, Dimitris Raidis and Alexandros Kouloukouris. 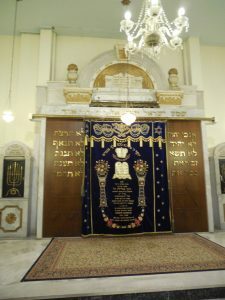 Mild artistic interventions were aimed at showcasing the eclectic character of the main prayer hall on the ground floor, while decorative motifs were accentuated – such as the murals in the ezrat nashim (women’s quarter), the stained glass windows, and the marble fixtures. 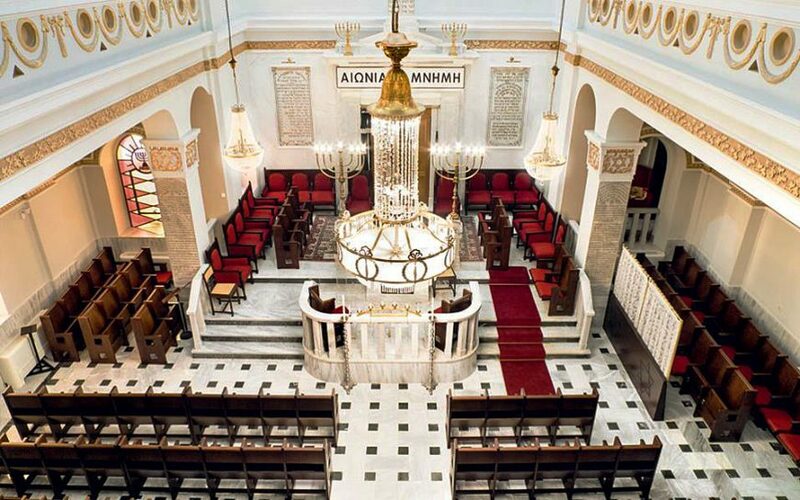 Transfer Thessaloniki is the best way to discover this beautiful Synagogue! We are here to transfer you from Thessaloniki Airport to Thessaloniki city center. Your transfer, is our pleasure!